Wow - so many beautiful interpretations of Louise Sharp's card design this week. Thank you to everyone who played along in our CASE the Designer challenge. It is just amazing how endless the creative possibilities are when we have a source of inspiration an how we can interpret and translate ideas to transform a blank piece of paper in to something completely new! We are so pleased to showcase your creativity and your beautiful projects. The right colour coordination and a delicate layering of elements made Emma's a stand out. Thanks for sharing this eye-catching, creative composition to the CASE the Designer sketch design and theme. 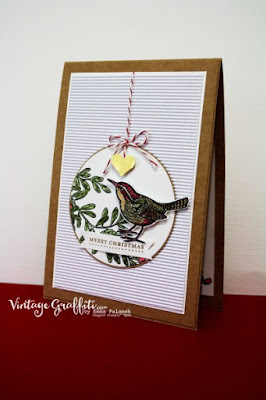 The little bird from the 'An Open Heart' stamp set is a perfect addition for Christmas themed cards. Holly's is another one of our weekly winners with this simple and elegant Christmas card. She was inspired by the colour combination, the sketch and theme of Louise's design to offer us a fresh, new and clever idea by creating a super cute wreath using the small leaves from the Pillow Box Dies. The results are stunning. Carolina was inspired by the colour combination and the circular layout of Louise's card this week and created a beautiful coordinating arrangement using stamps from Everything Eleanor set. The delicately fussy-cut flower with the pearl embellishments is a superb finish to her elegant card. And we love and appreciate you playing along with us Angela, Thank you. EEK!!! I'm a winner!!! I am so inspired every week by your awesome challenges here at the GDP and am loving playing along. Thank you so much for picking me to be a winner in amongst so many talented crafters. I am feeling blessed. Much love, Emma <3 PS. Bring on next week's challenge!!! Awesome work Emma! Your card is stunning. Congratulations! Wow *doing a happy dance* congrats to Emma - I'm a big fan of your gorgeous work! And also to Holly - wow the patience with all those tiny leaves! Thank GDP - you're all awesome!